Poaching salmon may sound difficult or gourmet, but this poached salmon recipe is so easy to make and so delicious you will want to make it over and over. Salmon is SUCH a healthy fish and so filled with needed nutrients like Omega-3 fatty acids. Add the onion, carrots and lemon slices to a pot of boiling water. Reduce the heat and simmer for 5 minutes. Gently add the fillets. Cook fillets for 7 or 8 minutes. Another quick and easy recipe for your files! A bit more lemon juice drizzled over the fillets tastes great. Add one or two lemon slices to the top of the fillet before serving for great presentation. Look here for more information on why salmon is considered one of our top 10 healthiest foods. I have used salmon fillets here, but it works equally well with salmon steaks. Just watch your poaching time. Steaks can be thicker than fillets and may require an adjustment to the cooking time. This is a delicious way to eat healthier. Salmon is so healthy already and to poach it with no fat creates a fabulous lean protein meal. This is a perfect diabetic recipe. Although everyone has their own level of tolerance for carbohyhrates, overall diabetes recipes should be healthy and fairly low carb. This recipe is both. 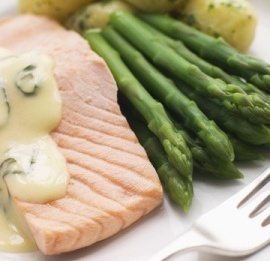 Of course, taste is supreme too and this poached salmon recipe is really good. 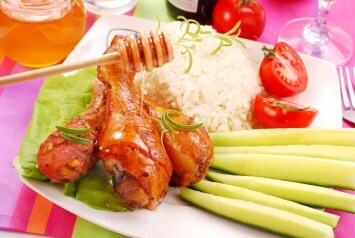 Subscribe to the site here and never miss a great recipe from Cookingnook.com. If you love this poached salmon recipe, look here for more great salmon recipes.